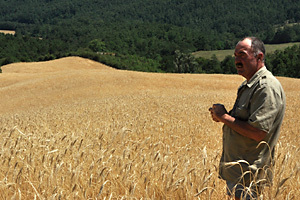 Poggio del Farro started and developed in Tuscany, in the Alto Mugello in the municipality of Firenzuola. Ours is a harsh land that has always suited extensive farming. 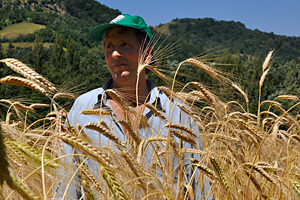 For many years, the main resource of our company has been the farmers and breeders of this untouched area between Tuscany and Emilia: believing in our project to reintroduce emmer, they helped us and rediscover and reintroduce this old and surprising cereal into the crop cycle. A relationship of mutual trust and co-operation binds us to our farms and this is vital to produce quality emmer without hurrying, complying with nature’s timescale that farmers have known for thousands of years and continue passing down to the new generations of farmers. Over 130 agricultural enterprises co-operate with us over the whole of the Apennines, from Tuscany to Tuscia and we hope we will expand even further. But the heart of our history beats with the producers of our Mugello!! Everything started thanks to Piero! 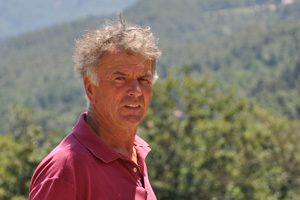 We owe him the start of the Poggio del Farro adventure and the rediscovery emmer cultivation in Alto Mugello. 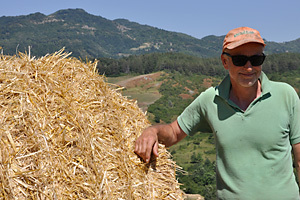 Piero runs his farm in Casetta, just a few kilometres from the Futa and Raticosa passes and grows, apart from our emmer odder and hay and breeds his very beautiful Charolaise beef cattle with passion. 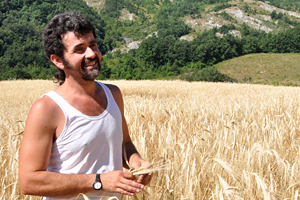 Romano has run for many years a thriving farm near the small village of Piancaldoli, a few kilometres from Firenzuola. 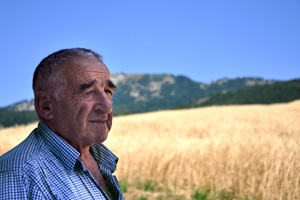 He combines breeding splendid Romagnola attle with growing fodder and cereals. Romano added our emmer to his crop rotation many years ago. 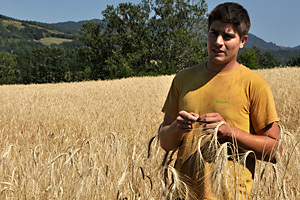 Simone runs his family farm with his father Marcello, in the wonderful hamlet of Caburaccia near Firenzuola. The land around Caburaccia looks wild and solitary. In this charming environment Simone’s farm grows fodder and cereals, among which strong our emmer, and looks after wonderful chestnut woods , the symbol and pride of our Apennines. 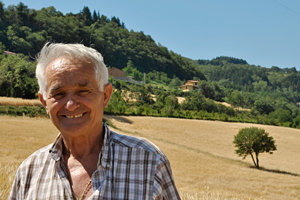 Franco and his sons, with their respective families, live in the very beautiful hamlet of Caburaccia, near Firenzuola. The land around Caburaccia looks wild and solitary. Apart from growing fodder and cereals, Franco’s farm breeds Romagnola cattle, reared in a rustic way and often allowed to graze in the countryside. He has grown high quality emmer since the first years of our company. Donatello runs his farm just a few kilometres away from Firenzuola, over the boundary with the province of Bologna, in the municipality of Monghidoro Donatello’s farm produces cereals, hay and wood. In his activity, he is helped by his nephews who, we hope, will continue to look after their uncle’s land. His farm has grown quality emmer for us for many years. Valerio runs his beautiful agricultural and livestock farm in the small hamlet of Le Valli near Firenzuola. He combines rearing splendid Chianina cattle with the gathering of chestnuts and the cultivation of fodder and cereals to feed his cattle, such as barley, to which, in his traditional crop rotation, he alternates our emmer too..
Remo runs with his family and his brother Bruno Ivo a solid agricultural and livestock farm in Riccianico just outside Firenzuola. Remo’s farm has been awarded very important international and national awards or raising Bruna Alpina dairy cattle. In his farm, he combines the production of milk with the cultivation of our emmer and other cereals that he rotates with fodder and alfalfa meadows to feed his cattle. Descending from a family of breeders and farmers, young Walter runs his mother’s farm located in Borgo Santerno, just outside Firenzuola, together with his mother and brothers. He combines the production of our emmer with barley and other cereals as well as fodder for his dairy cattle . Walter’s farm has supplied us with emmer since our company’s first years and markets its raw milk in Firenzuola thanks to a small distributor.